Captain America: The First Avenger Set Visit! As the images from the Captain America set began to leak out a few months ago, the question on the lips of many fans was "when will we see the Red Skull?" It’s not surprising really. Not only is the character at the core of the Captain America mythos, he is also one of the more visually striking in Marvel’s pantheon, and one of the most difficult to successfully realize in live action. Getting the Red Skull right was very much a team effort that began early on in the production process. Once the concept art had been approved, and Hugo Weaving cast in the role, it fell to Prosthetics Designer David White to translate the drawings into something tangible, as he explains. With the design finalized, White had to actually create the makeup. Starting initially with a lifecast of the actor, White sculpted the design of the makeup. Once he was satisfied with this, his next task was to break the makeup down into several component pieces, which were then used as the basis of molds. "It means a lot of people and a lot of time, and we have to process all the pieces," reveals White. The end result, though is a series of bright red-tinted silicone makeup pieces, ready to be applied. In addition to this silicone face mask, White's design also required Weaving to wear contact lenses and a set of bottom dentures that, according to White, "just kind of protrude at the bottom a little bit… so he has a mean underbite." While the effect that can be achieved by White is quite remarkable, for Red Skull to truly translate properly from page to screen, it requires additional help, which is where VFX supervisor Chris Townsend and his team take over. "This is a great start, what David White in prosthetics has given us, but obviously because Hugo is a regular human, he’s got a certain amount of fat on his face, he’s got a nose, which is unfortunate, so what we’ve done is put tracking markers over his face, and we’re in the process of looking at what he would look like once you remove the nose, what he would look like if you were to square up his chin a little bit more, if you were to make once of his eyes a little bit bigger, or both of his eyes. Or if you were to make all of that a little bit more extreme, and make his face much thinner." 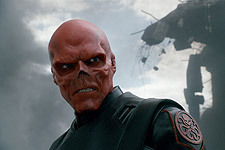 The collaborative work between the two departments has created a design for Red Skull that looks like it has come straight from the comics, but designing the look of the skull was only one minor part of creating the character. Equally important was the costume, a riff by costume designer Anna Sheppard on the uniforms worn by the Nazis during World War II, a striking look, but one that didn’t make life easy for Weaving. "If you look at Red Skull, this coat weighs a ton," Sheppard reveals, "even if I tried to make it light, I wanted leather, and this is the kind of leather that is thinnest, but still works in this, but it’s such a construction to follow the design that it’s unbelievable. It’s probably about 10 Kg. It looks OK on the mannequin, but poor Hugo… really feels the weight." Sheppard was restricted in the materials she could use, "I didn’t think it could be made out of plastic, it wouldn't look the same. You actually need the weight for the coat to hang correctly, and it looks fantastic, the movement. There's a big fight between him and Cap on the high gantry of Hydra's factory, and on the back it’s all pleated, and really moves beautifully, and for that you need weight. So I couldn't cheat on that, it couldn't be made any lighter, but they’re not easy costumes for actors. Lucky they understand they have to look this way." Unfortunately for Weaving, it wasn't only the costume that made his life uncomfortable. White took considerable pains to reduce the time Weaving had to spend in makeup, by painting each of the silicone pieces before they were applied to Weaving's face. Even still the makeup process took up to three hours. "It’s just such a smooth finish, very streamlined, and there’s a lot of different angles," and while that meant more time in makeup for Weaving, for White it did have some benefits, "In certain lights you get some lovely effects. It's like a Cadillac. In certain shots it's got a lovely quality to it. It just takes a lot of time to get everything in the right place." 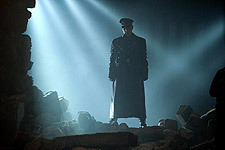 In addition to the massive technical effort involved in creating the character of Red Skull, there was also the human element, and for actor Hugo Weaving, that began by deciding how the character should sound, "I listened to a lot of Werner Herzog talking… also Klaus Maria Brandauer. I thought Klaus Maria Brandauer’s accent was probably more interesting in one way, but the more I listened to Werner Herzog, the more I found him amusing. So I sort of started to lean more towards him. There’s something wonderfully mad about him." The end result, with the prosthetics work by White, the VFX abilities of Townsend and Sheppard’s costume, this created what is sure to be a truly iconic villain, and one that is a suitable match for Chris Evans' Captain America on his first cinematic outing for Marvel Studios, a fact not lost on Weaving. "I think the major difference between Skull and Cap, they've both had the serum, and the serum seems to augment certain qualities that each of them have. Cap is much more in tune with other people I think. Schmidt is in tune with himself, and his own needs, and his own ego, so I suppose it augments that. From that point of view, they’re quite opposite."